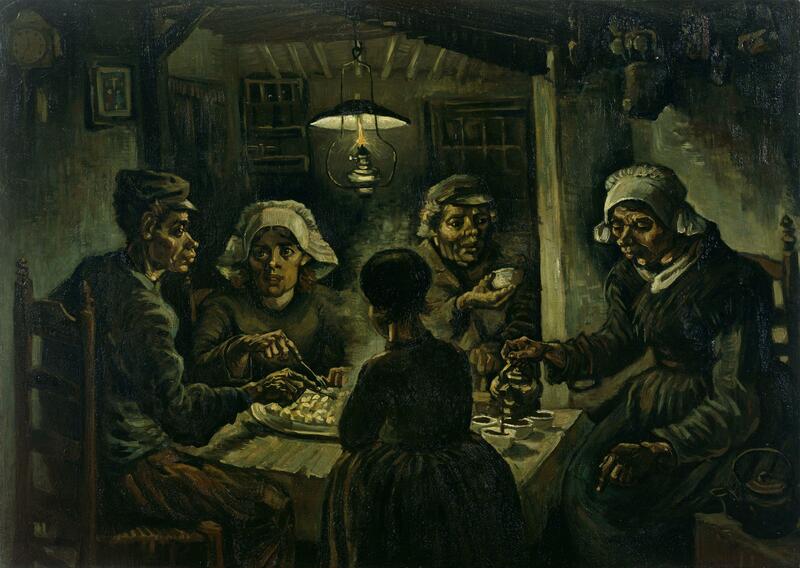 Born in the village of Zundert in North Brabant on March 30th 1853, Vincent’s career as a painter was relatively short. His oeuvre, however, was vast. Even during his darkest moments, the troubled Dutch artist managed to keep producing emotionally charged paintings that reach straight into the soul with their broad brushstrokes, sentiment and vivid colors. Though he showed an interest in art early on, before ever considering a career as a painter, Van Gogh’s calling was to follow in his father’s footsteps and become a preacher. He was a deeply religious man who firmly believed that his main purpose on earth was to serve others, especially the poor. In an effort to unite himself with their suffering, he led a simple life and did not care for worldly luxuries. He studied theology in Amsterdam and worked as a missionary in Belgium, but was neither successful as a student nor preacher. Therefore, at the age of twenty-seven, he decided to dedicate his life to art, hoping to somehow find solace in this creative profession. 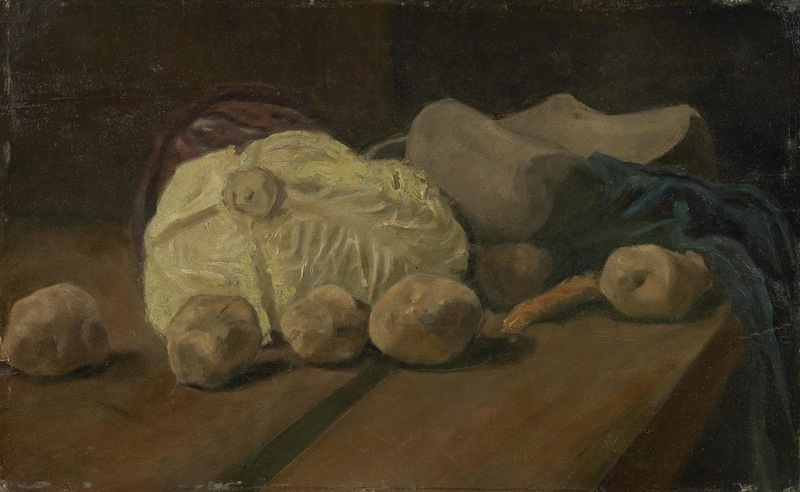 Just one year later, while in Paris, he painted what could perhaps be seen as his most appealing potato still-life: Still-Life with an Earthen Bowl and Potatoes (Museum Boijmans Van Beuningen, Rotterdam). 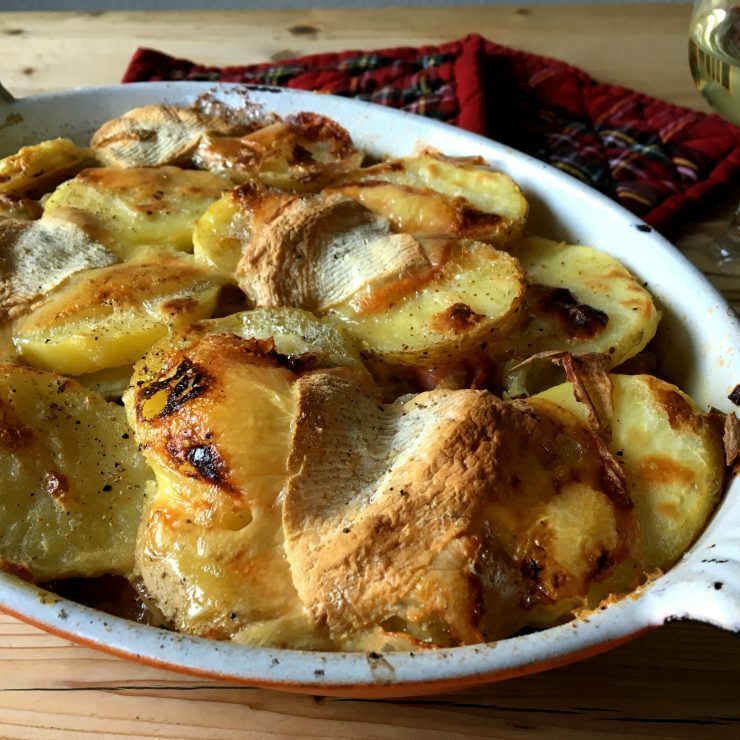 In this painting we see a fondue pan known as a ‘caquelon’ filled to the brim with ochre yellow and red potatoes. 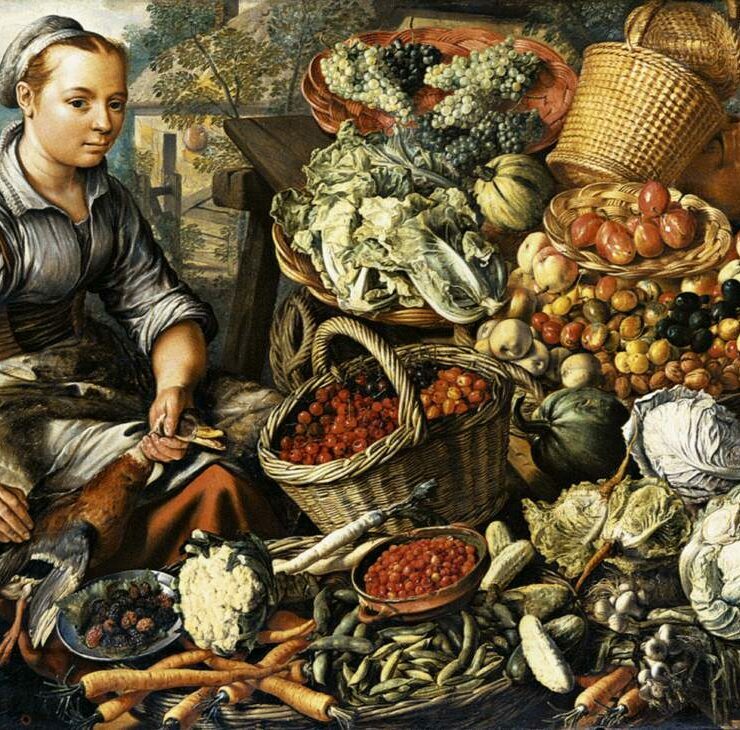 More potatoes are strewn about, and much like The Potato Eaters, the painting is executed in thick brushstrokes and a dark palette. 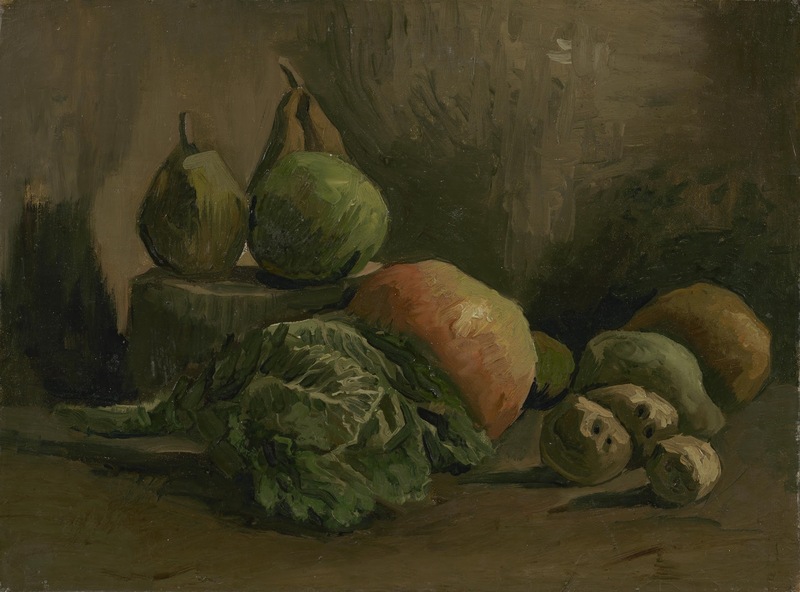 Similar still-lifes (equally somber in color) produced during the first half of his artistic career include: Still-Life with Cabbage and Clogs (1881, Van Gogh Museum, Amsterdam), Still-Life with Vegetables and Fruit (1884, Van Gogh Museum, Amsterdam), Still-Life with an Earthen Bowl and Pears (1885, Centraal Museum, Utrecht) and Still-Life with Apples and Pumpkins (1885, Kröller-Müller Museum, Otterlo). A change was noted in his oeuvre after he moved to Paris at the end of February 1886 and came in contact with leading artists such as Degas, Toulouse-Lautrec, Seurat and most importantly, Gauguin. He was greatly influenced by their use of vivid tones, and it wasn’t long before color became one of his main forms of expression. It should come as no surprise then, that some of his most colorful (food) compositions were produced in Paris just a year later in 1887. One thing, though, remained the same — the simplicity of the composition. 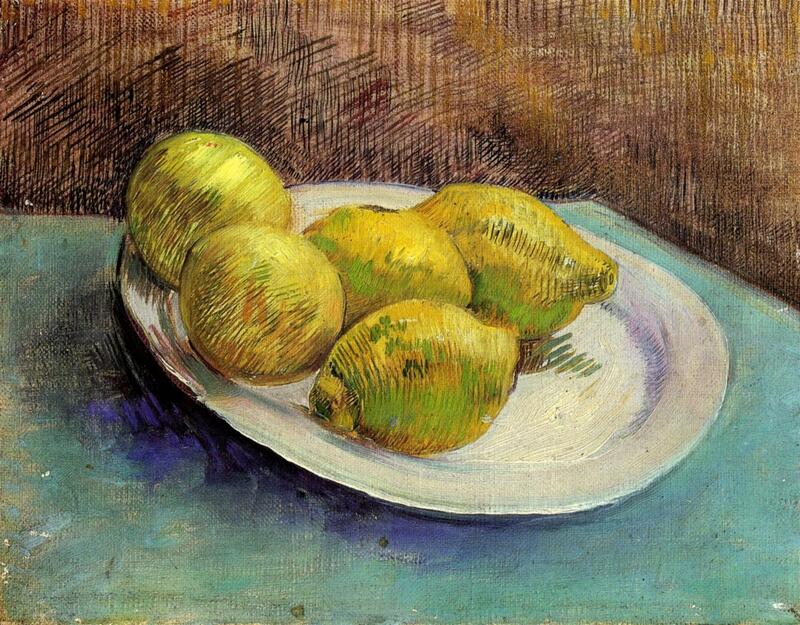 A wonderful example of this development is his Still-Life with Lemons (spring of 1887, Van Gogh Museum, Amsterdam). Five lemons are seen on a simple white plate set on a table covered with a light blue tablecloth. Upon closer inspection, subtle nuances in color, both in the lemons and in the background, can be noted. The influence of the impressionist painters is evident in his use of brighter colors and preference for a more finer brushstroke. During the course of that year, his use of color would only intensify. 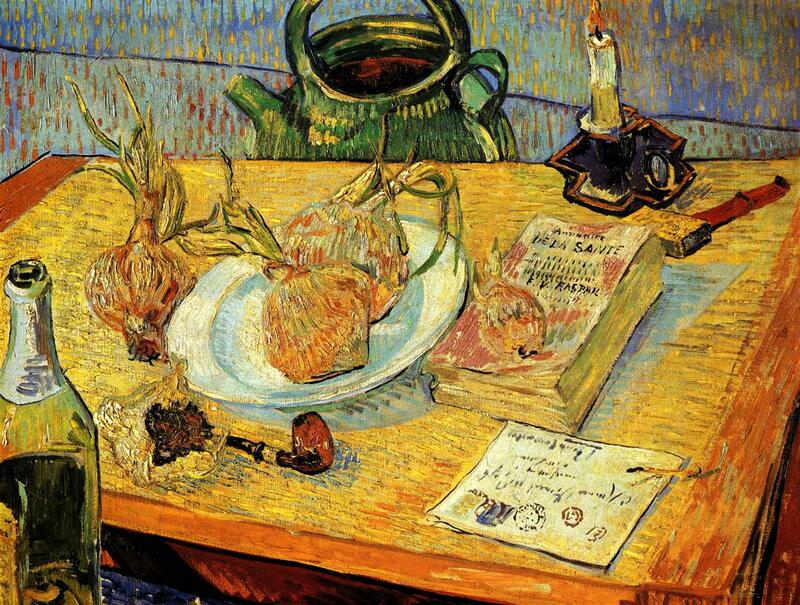 Somewhere in the late spring/early summer, he painted his Still-Life with Decanter and Lemons on a Plate (Van Gogh Museum, Amsterdam). Here, we notice that the colors are a bit richer. In the somewhat clashing composition we can also detect how he was influenced by Japanese prints. 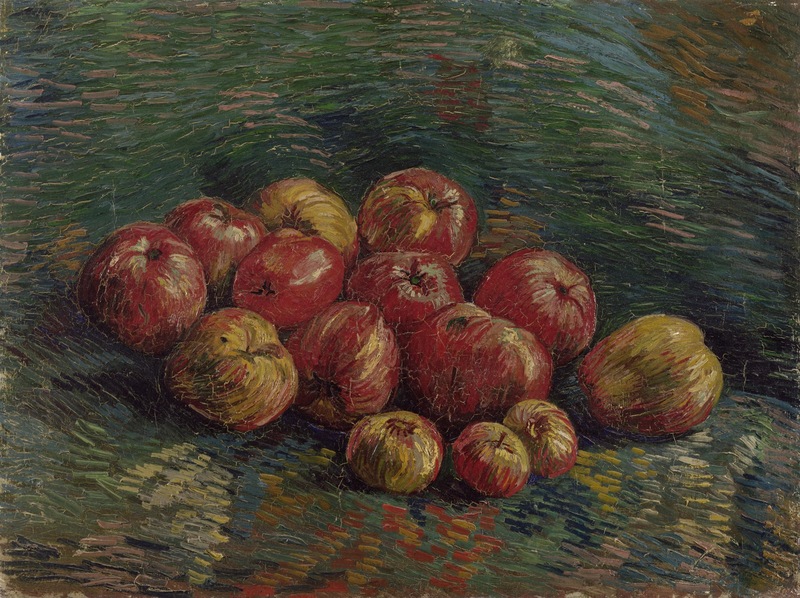 Other still-life examples of this more colorful style of painting include his lively Still-Life with Apples and his Still-Life with Grapes, both produced in the autumn of 1887 and at display at the Van Gogh Museum in Amsterdam. In the latter, the use of contrasting shades is especially striking. In February of 1888, Vincent left Paris for Arles where he would enter one of the most productive periods of his career. 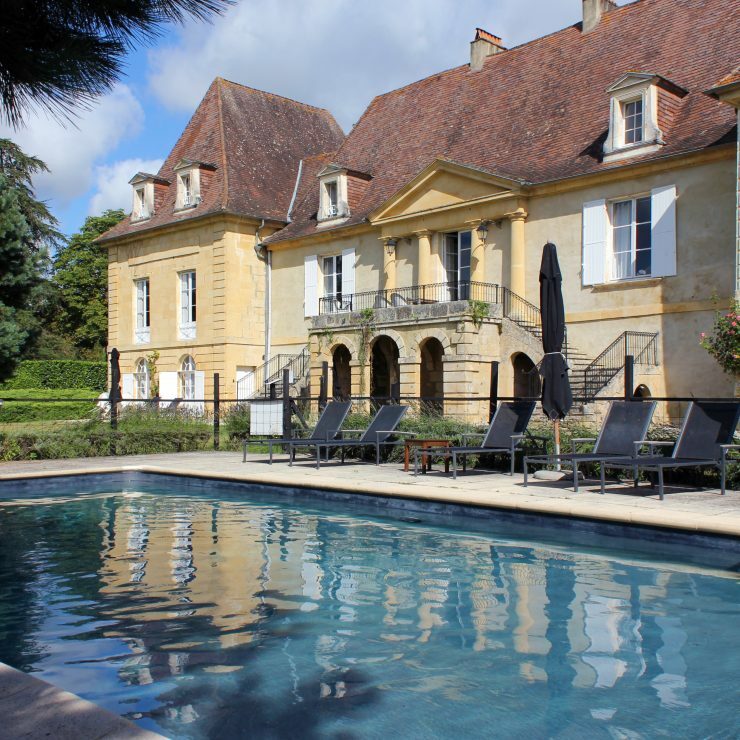 Of course, the lush landscape of the Provence with its explosion of color would also leave its mark in his works. 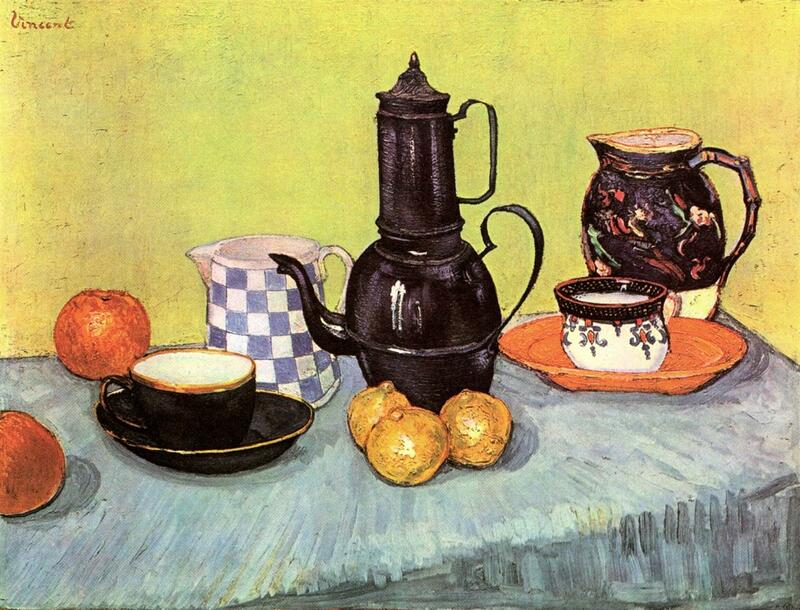 In his 1888 Still-Life with Blue Enamel Coffeepot, Earthenware and Fruit (private collection), Van Gogh proudly painted some of the first things he purchased when he moved into the famous ‘Yellow House’: plates, cups, pitchers and a coffee pot. 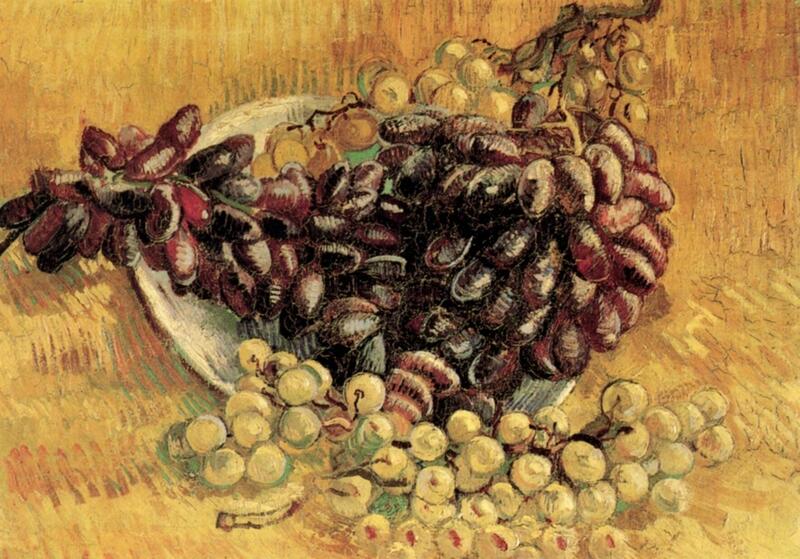 Van Gogh did not have an extravagant taste in food and could do with very little. One thing he could not do without, however, was coffee. He once survived for five days on nothing but dry bread and twenty-three cups of coffee! Whether in his food paintings or other types of still-lifes, landscapes or portraits, Van Gogh’s work is moving and attests to an incredible vitality despite a most tragic life. On July 29th 1890, two days after shooting himself in a field outside of Auvers-sur-Oise, a small village near Paris, Van Gogh breathed his final breath leaving behind an oeuvre that would become renowned the world over.